This field sketch of the chalk hills of the North Downs in Kent extends from Doddington and Newnham, at the bottom of the map, to Norton, at the top. Several irregularly cut sheets have been joined together and laid down on coarse paper. 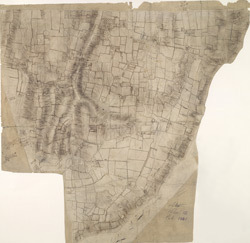 The surveyor's calculations for for the area covered by the map survive in black ink along the margins. The 'fair' drawings OSD 110 and OSD 110/111/113 also relate to this area.